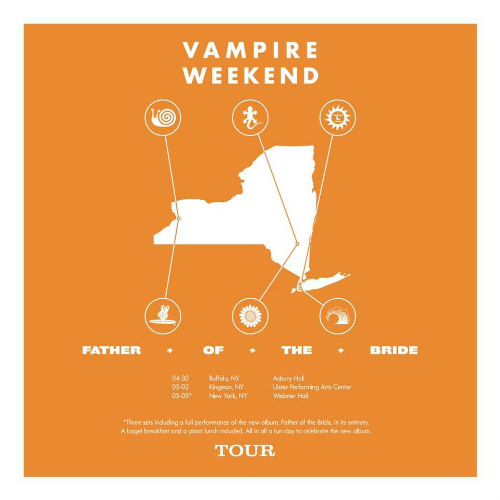 Vampire Weekend have added three New York concert dates, in conjunction with the upcoming release of their Father Of The Bride album on May 3, 2019. Kicking off their schedule, the indie rockers recently added dates in Buffalo on April 30, Kingston on May 2, and a special all-day event at the newly renovated Webster Hall in New York City on May 5 where the band will play "three sets including a full performance of the new album, Father of the Bride, in its entirety. A bagel breakfast and a pizza lunch included." With over 50 shows planned, this is Vampire Weekend's first full-blown tour since 2014. After the New York album release shows and a couple of festivals, the headlining North American concerts are scheduled to begin in June with the band traveling from coast-to-coast and performing at amphitheaters, arenas, and more festivals. European festivals are scheduled in July, before they come back for another leg of American concerts in the late summer. Then, back to Europe for a headlining tour in the UK, France, Belgium and Holland. When do Vampire Weekend 2019 tour tickets go on sale and what is the presale code? Tickets for their previously announced dates are now on sale. For the new shows, the general public on-sale for Buffalo and Kingston begins as early as April 12 at 10 am local time. An on-sale date for the May 5 concert has not been announced yet, and there are no presales happening. Keep in mind, each date is different and details are subject to change. Click through the individual concert links for more information about the show you're interested in. We recommend following Vampire Weekend on social media and signing up for their free email newsletter, in addition to checking your local venue’s social media and email subscription, to get the most up-to-date information. Also of note, Rostam Batmanglij left the group in 2016 to pursue solo projects but has continued working with them as a collaborator. He is listed as a producer of at least a few songs from the FOTB album, but his involvement going forward is not totally known. For more, check out Vampire Weekend's Zumic artist page.